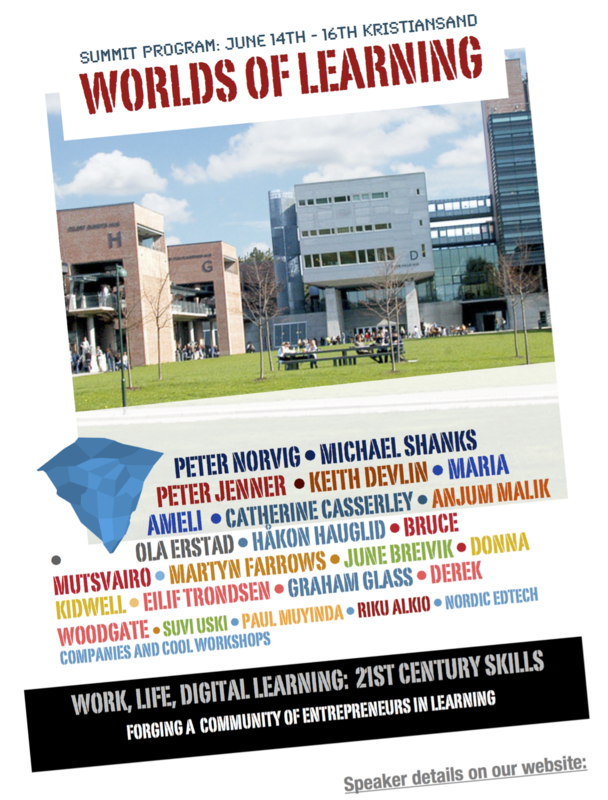 Join us for this year’s World Learning Summit – our 9th annual conference at the Future Learning Lab. Get to know our world class program of speakers and continuing discussions. Our community is growing and friendly, with speakers and attendees coming back year after year. Our theme this year is E-QUALITY: One key aspect of that term is future access to learning in a world that is increasingly becoming “digitalized” and “on-lined”. A number of future scenarios are open – technological, sociological, pedagogical, cultural and political. The other aspect of E-QUALITY is our understanding of learning in a world that is defined by uneven opportunity, and where the emergent eco system is understood by some as levelling the digital and institutional divides and by others as extending social injustice and difference. How do we learn, teach and interact in globalized life-long learning – what challenges for students, teachers, education managers, business leaders, and policy-makers alike? At WLS, international entrepreneurs join with internationally recognized scholars as well as business leaders and policy-makers, to co-create new insights and understandings of our changing world learning eco system. Topics also coming up: Artificial Intelligence, Big Data, Virtual Reality, and New Designs for Life Long Learning. Posters and stands at WLS 2019! Professor of media studies at UiA. Professor of journalism studies at NLA University College. Founder, WLS and Future Learning Lab. CTO at Arizona State University. Vice Chair of Future Learning Lab. Early MOOC pioneer, in her former job at University of Texas. CEO of Sunsense, co-founder of World Learning Summit. Entrepreneur and long-time employee at UiA. Former Executive Director of HStar Institute at Stanford University. Now in charge of the their Nordic and Baltic relations. PhD from the University of Aarhus, CEO and founder of the learning company Adapto. CEO and Founder of Open Innovation Lab of Norway, a partner with WLS. Former CEO of Creative Commons, pioneered Open Courseware at MIT. Associate professor of pedagogy at UiA, with specialization in computer assisted collaboration. Register for WLS early! It will help us plan the event and the rebates are substantial. Plenary program, all workshops and events included. Sign up here to receive our newsletters. In between summits we update on other events, webinars, roundtables and more.